– have some familiarity with setting up and using KDB and KGDB (a bit of this is covered here, not all); also, see some useful Resources just below..
USBTTL serial breakout board. I’m using FTDI’s FT232R Breakout board; it works very well indeed. 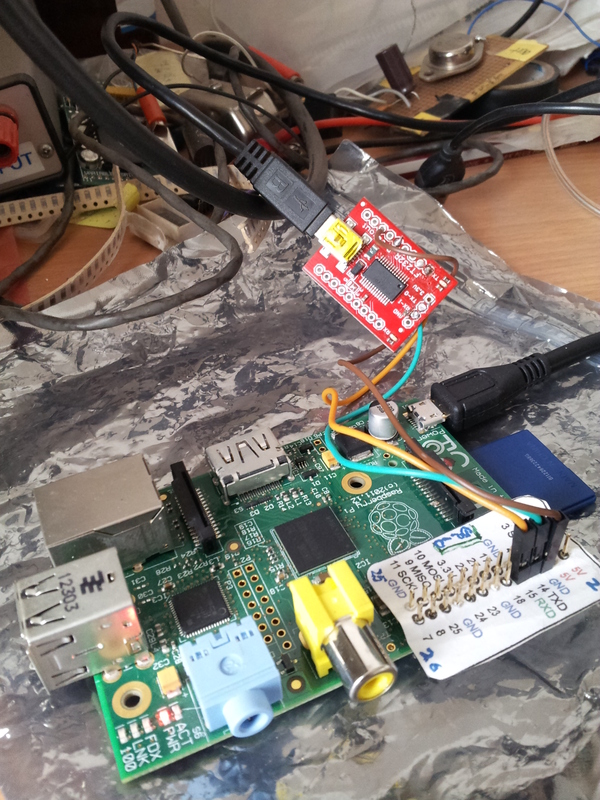 Above pic: My R Pi (Model B) attached to a FTDI FT232R USB-to-TTL breakout board. The R Pi (that’s Raspberry Pi for those of you still not wakey-wakey) is a fun powerful embedded computer to play with. Yes, it runs Linux (the Raspbian distro for R Pi is particularly popular), and yes, Linux does run into trouble now and then, especially when we geeky types fiddle with kernel-level touch-me-not’s. So: when you do have a kernel bug, how does one proceed? A little googling will quickly reveal some powerful Linux kernel debugging tools- often near the top of the list is KDB and KGDB [here’s a pretty neat page covering this on the awesome stackoverflow site]. This blog post is not intended to cover it all in gruesome detail; rather, it gives you a flavor of how to setup and use these tools on the R Pi running a custom (yes, that’s right – your very own compiled-from-source) Linux kernel. For the discussion below, we assume that the kernel has been successfully configured, built (and works) for the R Pi. 1. Want more details? See Documentation/kernel-parameters. . Also, the “debug” param is not strictly required..
kgdb: Registered I/O driver kgdboc. use 'ps A' to see all. 0xc0000020 e3a00000 e3a01042 e3811c0c e59f2000 ....B........ ..
phys 0x00000020 e3a00000 e3a01042 e3811c0c e59f2000 ....B........ ..
How do we “break into” KDB from here? (^A => press Ctrl and keeping it pressed, press the ‘a’ key). This GDB was configured as "--host=i686-pc-linux-gnu --target=arm-buildroot-linux-uclibcgnueabi". Breakpoint 1 at 0xc03c9958: file kernel/panic.c, line 70. Breakpoint 2 at 0xc0100fe8: file fs/sync.c, line 103. Breakpoint 3 at 0xc00d4004: file fs/read_write.c, line 367. (The details are very similar to the section “Scenario II | Using KDB later (while apps are running)” above). The rest of the discussion is the same as “Scenario III | Using KGDB …” above. HTH, Enjoy! is it possible to kernel debug with a usb-to-serial-converter attached to the rpi and the host machine connected with a null modem cable? Am unsure- never tried that. However, http://elinux.org/RPi_Serial_Connection seems to show how you can do this. Yes the cable should be okay. Which terminal emulator app are you using? I had problems with minicom; I switched to using ‘screen’ and it worked well. OK I will try with “screen”. Nevertheless I did a test with ttyAMA0 only for kgdboc / KGDB and tty1 (console on graphic screen).